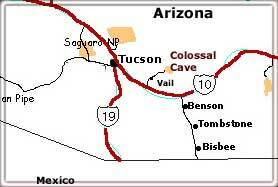 It's always perfect weather for touring Colossal Cave, just twenty two miles southeast of Tucson, Arizona. One of the largest dry caves in North America, it maintains a pleasant seventy degrees Fahrenheit temperature year-around. Located in the Rincon Mountains at an elevation of three thousand seven hundred feet, the entrance commands a panoramic view of the Sonoran Desert. The cave is not fully explored, but scientists estimate that there are at least thirty nine miles of natural tunnels inside the cavern. Due to the enormously complex three-dimensional maze, it took over two years to map the two miles of passageway that are fully explored. Groundwater seeping through the Escabrosa limestone formed the cave. Over millions of years, stalactites, stalagmites, columns and draperies formed slowly from water dripping from the ceiling. As the climate became more arid, the cave gradually dried up. 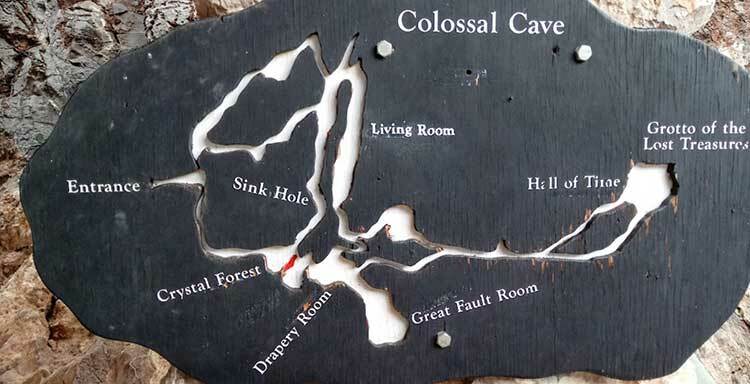 Today, Colossal Cave is "dry," or dormant, and the formations are no longer growing. 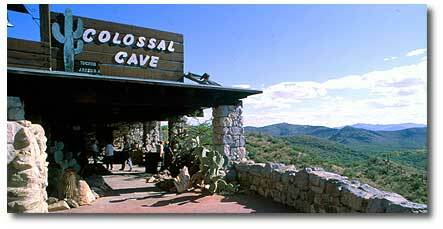 Colossal Cave Mountain Park is listed on the National Register of Historic Places, and it certainly has a history. The cave was officially "discovered" in 1879, but artifacts and soot-blackened ceilings testify to use by prehistoric cultures. Recent studies show it once served as a Hohokam shrine. Today visitors take a fifty-minute, one-half mile guided tour down six stories into Colossal Cave to see the beautiful formations. Tours leave from the gift shop at the entrance. There is a ramp to the gift shop, but the cave itself is not wheelchair accessible. 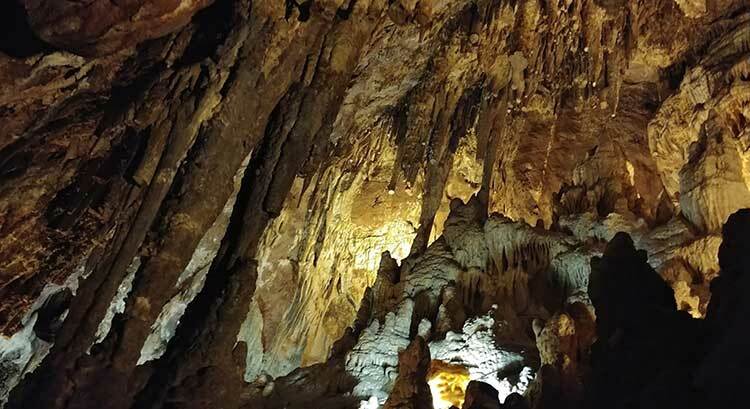 Deep inside the cave, tour guides explain how the cave formed, point out the beautiful formations, and tell the "Bandit Legend," the favorite part of the tour for many guests. According to the legend, the cavern served as a bandit hideout twice in 1887, after two exciting train robberies. In one holdup, the robbers disconnected the train's engine, mail and express cars and took off for Tucson, leaving the rest of the train and passengers stranded in the desert. In the second robbery, the bandits turned the locomotive over on its side with the engineer still in it. According to rumor, up to sixty thousand dollars were hidden away in the cave then later retrieved by one of the robbers. What finally happened to the money is still murky. Wells Fargo never did reveal exactly how much money was actually stolen. The one hundred and twenty-year-old historic La Posta Quemada Ranch, a working cattle ranch, is located within the park. There is a second gift shop, a snack bar and a gemstone sluice along with a butterfly garden and tortoise enclosure. Many people enjoy hiking the trail system and birding along the riparian area. Trail rides are also available from the ranch. Scenic route: From East Broadway in Tucson, turn south onto scenic Old Spanish Trail and follow it about seventeen miles to Colossal Cave. Alternate route: Take Interstate Highway I-10 east from Tucson to Exit 279 (Vail Exit), turn north, and follow signs for about six miles to Colossal Cave.